A former employee at Kia’s corporate headquarters says he warned the automaker as far back as 2017 that faulty engine recall work was to blame for car fires. “I’m coming forward because people’s lives are at risk,” Jason Vaughn told I-Team Investigator Jackie Callaway in an exclusive sit-down interview. 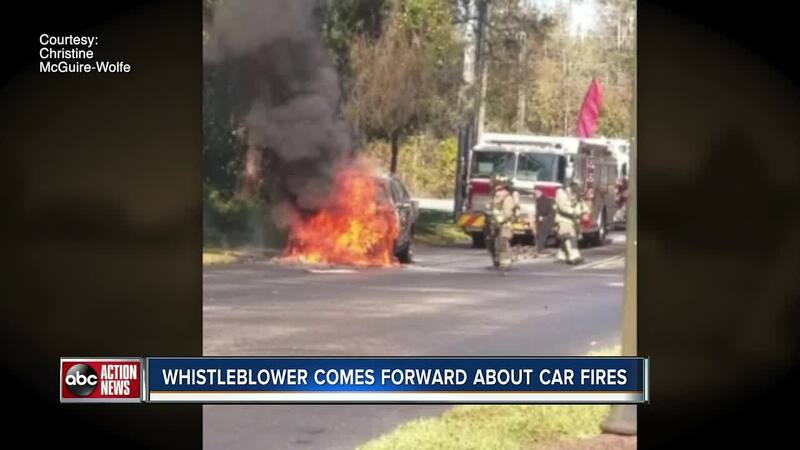 Vaughn worked for the warranty department at the headquarters for Kia Motors America in Irvine, California before he left the company last month – claiming he was pushed out of his job for raising concerns about the car fires. Vaughn told the I-Team he was performing Kia dealer audits in 2017 when he discovered dealerships performing engine recalls improperly – leading to highly flammable fuel pump leaks. Vaughn said he alerted his boss during a warranty operations meeting circa November 2017 but didn’t get the reaction he expected. So far, drivers in 44 states have reported 276 Kia and Hyundai fires – including 25 in Florida, according to the Center for Auto Safety, which provided figures through the first week of January. The U.S. Attorney’s Office in New York City has also reportedly opened an investigation into whether Kia and Hyundai handled engine recalls properly. Kia and Hyundai have refused to comment on any possible federal investigations. Just days after I-Team Investigator Jackie Callaway interviewed Vaughn and contacted Kia about his claims, the automaker and its sister company, Hyundai, announced a plan to recall more than 150,000 cars and SUVs for fuel pump issues . Kia estimates its fuel pump recall would involve more than 50,000 Kia Optimas, more than 17,000 Kia Sorentos and about 1,000 Kia Sportages. Hyundai estimates about 100,000 vehicles will be recalled. But a watchdog group is already calling for the automakers to expand their recall, saying it suspects many more vehicles not on the recall list pose a fire risk. Last year, the Center for Auto Safety announced it wanted Kia and Hyundai to recall nearly 3 million vehicles due to concerns over car fires. In November, the U.S. Senate Commerce Committee called for a hearing on Kia and Hyundai fires, but that hearing – scheduled for Nov. 14 – was canceled after the CEOs for the auto giants refused to attend and explain what’s causing these fires. 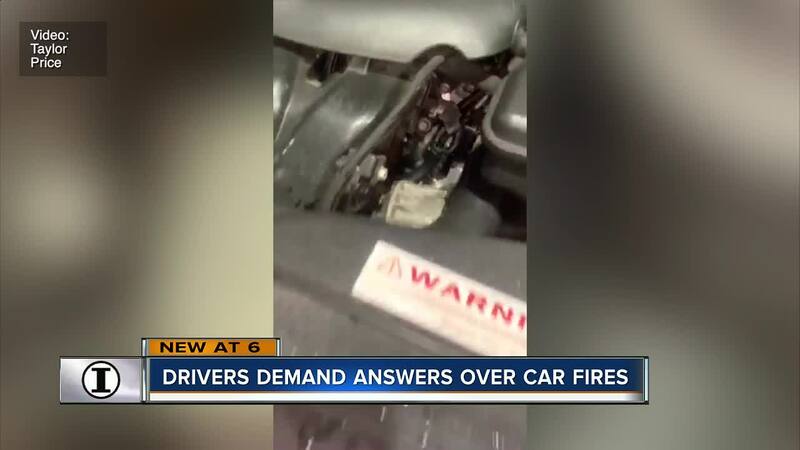 The I-Team first uncovered the post-engine recall fire hazard in Kia vehicles in November – after speaking with auto experts and tracking down a mechanic bulletin from 2011 that warned of the potential of fuel leaks if engine replacement work wasn’t done properly. Two separate Kia owners – one in North Carolina and the other in Louisiana – shared videos with ABC Action News that showed spewing fuel pumps just weeks after their engine recall replacements. Vaughn told the I-Team his biggest fear is a car catching on fire with young children inside. Chris McGuire-Wolfe said she’s thankful her two young sons weren’t in the car when her 2012 Kia Sorento burst into flames as she drove down State Road 52 last month. McGuire-Wolfe showed ABC Action News how her younger son’s booster seat melted into the back seat during the fire. McGuire-Wolfe, a Pasco County firefighter, said she doesn’t think she would have been able to get her two sons – ages 7 and 11 – out of the car in time. She said she didn’t even have time to grab her wallet from the passenger seat before escaping her burning vehicle. McGuire-Wolfe also said she didn’t receive an engine recall notice from Kia until the night after the fire – meaning botched recall work is not to blame in her case and raising the possibility there are other potential causes to these fires. McGuire-Wolfe showed the I-Team an email from Kia confirming they inspected her burned-out car. The I-Team requested a copy of that inspection report, but a spokesman said the company is still reviewing McGuire-Wolfe’s case. Vaughn said his bosses pushed him out of his job because of his concerns over car fires. He showed the I-Team a confirmation email that shows he submitted an application to become a federal whistleblower with the U.S. Securities and Exchange Commission. The SEC’s Whistleblower Program was created by Congress to provide monetary incentives for those who report possible violations of the federal securities laws. A spokesman for the SEC told ABC Action News the agency could neither confirm nor deny the existence of any complaints or investigations. The spokesman also told the I-Team Kia has repeatedly warned its car dealerships about the issues Vaughn cited and said it brought Vaughn’s concerns to the National Highway Traffic Safety Administration. Vaughn said there were six other Kia employees in the room when he brought up his car fire concerns with management at the 2017 meeting. The I-Team reached out to those six workers and Vaughn’s former manager via emails, phone calls and messages on social media sites for comment on that meeting. The manager and one of those workers directed the I-Team to contact Kia’s corporate communications. The others did not immediately respond to requests for comment. A Kia spokesman did not respond to questions about the meeting or when company leaders first learned about Vaughn’s concerns. Kia Motors America issued two statements on Vaughn and the whistleblower situation. The first can be read here and the second can be read here . Local Kia driver Taylor Price told the I-Team he’s frustrated after hearing Vaughn’s account on ABC Action News. “The fact you would not take the steps to seek that out immediately and people are at risk of losing their lives,” said Price after watching I-Team Investigator Jackie Callaway’s interview with the Kia whistleblower. Price said he was driving his 2011 Kia Optima earlier this month on New Year’s Day when he noticed the strong smell of gas. When he opened his hood, he said he found a leak in his fuel pump and shared video he shot of the leak with the I-Team. Price said he complained the next day about the problem, but a Kia dealership said they couldn’t make the repair because it wasn’t under warranty. Price said he ended up purchasing a replacement part and making the repair himself. As part of the recent recall, Kia said it will reimburse Taylor for that repair.